Bossini 2nd anniversary with Rilakkuma! And the #Rilakkuma craze continues! 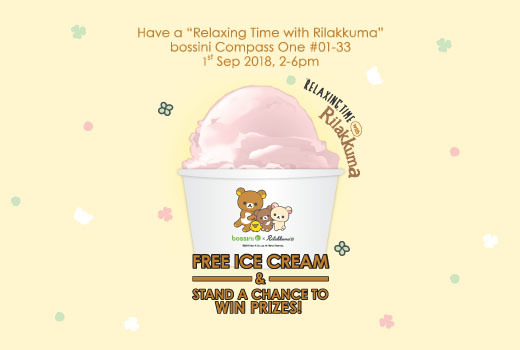  Join us for a fun and relaxing afternoon as we celebrate the store’s second anniversary with #bossinixRilakkuma ice cream, exclusive offers and attractive prizes  to be won this Saturday, 1 September (2-6pm) at bossini Compass One #01-33. Terms apply.